Discover the magic of Emerald Lake in the third book in the Emerald Lake Billionaires series. All of my series are linked. If you find a character you like in one book you could find them in another story. 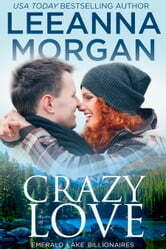 If you would like to find out when my next book is published, please visit leeannamorgan.com. Thank you for your support. Happy reading! Another awesome story from Ms.Leeanna Morgan. Well written, love the characters. Could hardly wait for another one to read. I have most of Ms. Morgan' books. I'll keep buying!